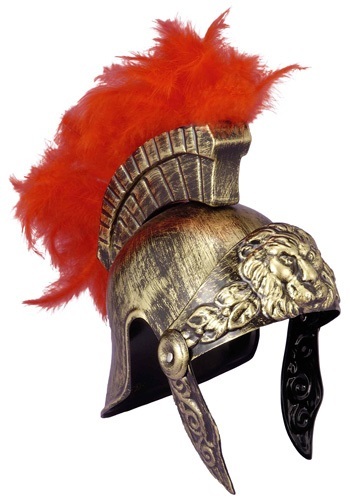 Protect your head while you're off to war in this Roman Centurion Helmet. The helmet is made of molded, lightweight plastic. The entire helmet is glazed in a gold-bronze paint and features a movable visor and movable cheek guards. A red feathered crest fits into place at the top of the helmet to complete the classic Roman Galea. Pair the helmet with a sword and shield and one of our many Roman costumes!